The dominant doubles duo of Erin Larner and Maddie Lipp that entered the NCAA Doubles Championships as the fourth-best pair in the country almost never existed. Coming into being after coach Claire Pollard paired the two together during their senior years, Lipp and Larner’s partnership was possible only because of a shoulder injury that forced Lipp to redshirt her sophomore year. But a decision that came four years earlier had much greater implications for the future of Northwestern women’s tennis. Lipp, of course, wasn’t the first talented athlete to have to choose between multiple sports in high school, but her commitment to tennis and later to the Wildcats would impact the program for years to come. A five-star, blue-chip recruit coming out of Lake Forest High School, Lipp said she was courted by and had to choose between Duke and Michigan — traditionally, two women’s tennis powerhouses — as well as NU, which had dominated the Big Ten over the past decade. When Lipp arrived on campus as a freshman in 2013, the Cats had won a Big Ten title in some capacity (either as regular season champions or by winning the conference tournament) for 15 consecutive years. After bringing in the third-best recruiting class that year, according to the Tennis Recruiting Network, NU added yet another title to its streak. But if Lipp expected three more years of similar success, she was sorely mistaken. Even after adding yet another five-star recruit to the team in Larner, the Cats struggled to overcome the loss of key players due to graduation and injury. Lipp and former NU star Manon Peri each fell victim to injury early in the 2014-15 season, forcing Larner to step up at No. 2 singles in her first year. Erin Larner awaits a serve. Larner played No. 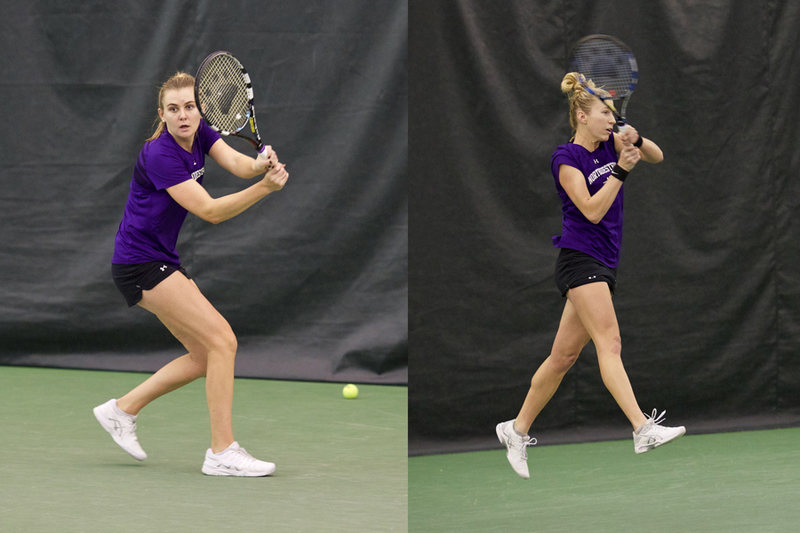 1 singles on a 2018 Northwestern team that went undefeated in the Big Ten regular season. Larner was no stranger to contributing in a team setting. She went undefeated in her four years on the Jesuit High School team in Portland, Oregon. Meanwhile, she also made a name for herself on the USTA and ITF junior circuits en route to becoming the No. 1 recruit in Oregon and top 30 in the nation. Despite her achievements, Larner said she felt overlooked because Oregon was not known for cultivating top talent. In fact, she believed Pollard had lost interest in her at one point during the recruiting process. However, the relationship persevered, and when it came time, Larner made her decision very clear. While Larner and Lipp weren’t immediately able to recreate the success that had largely preceded their arrival — the 16-year title streak turned into a three-year one with no hardware — their faith in Pollard’s abilities as a coach and their own unrelenting work ethic ultimately paid off. Coming off her shoulder injury, Lipp said she worked daily to improve her game in a way that is atypical for a Division I tennis player: by altering her forehand stroke. Lipp explained that coming off her surgery, she became increasingly bothered by what she called a “hitch” in her forehand. To try to solve the problem, she made a bold transition to a rather unorthodox two-handed forehand. Maddie Lipp hits a return. Lipp, together with Erin Larner, composed one of the best doubles pairs in the country this spring. That stroke change proved indicative of the work ethic that made Lipp and Larner such a successful senior duo and allowed them to restore the Cats’ program to the dominant state that had once enticed their commitments. The two posted a 19-4 record at No. 1 doubles together, becoming the top-ranked doubles team in the nation at one point during the season. Their efforts led NU to an undefeated Big Ten regular season as well as some success on the national stage. Pollard repeatedly referred to Lipp this season as one of the hardest-working players she’s ever coached. And Lipp, in turn, used many of the same words to describe her partner.